Our Check Please sticker design template makes it easy to print custom stickers for your café, deli, diner, restaurant, or other food service venue. Available in four different color schemes to accentuate your brand, two shapes, plus three unique edge finishes, Check Please is a contemporary sticker that’s sure to catch your customers’ eyes. 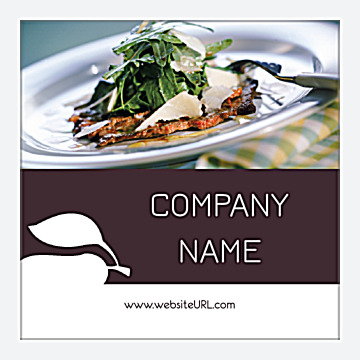 Check Please features your business or venue’s name on a solid color bar with a cut out pear design in the bottom corner, flanked on the top with a replaceable image of a tasty dish and on the bottom with a white bar with your website URL. Promote your business anywhere stickers can be placed when you print custom stickers. Personalize your stickers with your own brand’s text and images today! Our online sticker maker lets you point-and-click your way to a custom stickers in just minutes. Start by choosing a professionally-designed template from our sticker template library. Next, pick your color scheme and sticker shape. Finally, personalize with your own text and image. It’s so easy! When you’re done creating your sticker design, you can download a free, shareable PDF and get valuable feedback from your friends and team members before you print your stickers. With sticker printing from PsPrint, you can count on affordable pricing and great value. Our stickers are printed on premium, high-quality paper stocks with vibrant soy-based inks. And, with our 100% customer satisfaction guarantee, you can be sure that you’ll be delighted with your final product. Need assistance with your sticker printing project? Our friendly custom printing team is on standby to help you print stickers as unique as your business. For some extra pizzazz consider adding a foil stamp to your stickers. And check out PsPrint’s other custom sticker products including bumper stickers, sheet stickers, window clings, and more! PsPrint is your best choice for custom sticker printing!